All dog walkers and pet sitters in The Colony are employees of DFW Pet Sitting. They are bonded and covered by our liability insurance. We employ pet lovers who work in their immediate neighborhoods, usually within 5 miles from where they live. Our company monitors each and every assignment. Manager or owner are on call 24/7. All dog walkers and pet sitters in The Colony live in your neighborhood near you. Finding a company that is reliable, local, established and professional will make your travel easy and worry-free. With the best dog walkers and pet sitters in The Colony, we are here to offer you a worry-free pet care experience. The Colony, Hebron, Lewisville, Plano, Carrollton, Farmers Branch, Frisco, Allen, McKinney and most areas of Dallas are major areas that our The Colony pet sitters cover. Your pet sitting and dog walking professional won’t drive too far to get to you, and you know: if it’s convenient for your pet sitter, you’ll have fewer reasons to worry that they will let you down. Plus, the manager on call monitors each pet sitter’s activity, and we make sure the schedule is followed thru. We offer pet sitting and dog walking services in all zip codes of The Colony and all surrounding areas. Our dog walkers and pet sitters in The Colony stay in their immediate neighborhoods and focus on quality pet sitting. The Colony branch was an organic extension of our company as our clients were relocating there, and we just couldn’t say “No”. The relationships we form with our clients are very close and personal, and we become their extended family. Our pet sitters grow fond of their four-legged friends, and our two-legged clients love the consistency. High level of service quality is our focus, and you will always know what to expect. One by one, we were hand-picking professional pet sitters and dog walkers in The Colony and training them under our brand. Our training process consists of reading, writing, and hands-on experience. Consequently, we check references. We also do a full background screening. Kaye joined The Colony branch of DFW Pet Sitting in the summer of 2016. She now has a nice established client base in the area and takes pride in being a professional pet sitter. Every client she meets becomes like an extended family to her. She loves animals, and treats each pet she cares for as if he/she were her own baby. As an employee of DFW Pet Sitting, Kaye is professional, reliable, and thorough. Your babies will be in great hands with her! And yes, she does have a furry baby of her own! She adopted a 4-week old rescue puppy on a Sunday, and they named her Sundae. She’s a lab-chow mix and is 12 years old now. She’s got some grey hair now but still acts like a puppy. Kaye’s favorite thing to do with Sundae is nice long walks. She even knows tricks, too. Laying around and lounging in bed is another awesome thing they enjoy together. Life is good when you have your best friend next to you!! The Colony pet lovers often choose The Shoreline Trail for a refreshing break away from the city! If you live in The Colony and have a dog, you probably already know what we are talking about! 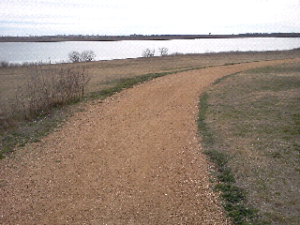 The Colony Shoreline Trail is a 3-mile trail that follows the Southeast shoreline of Lake Lewisville. This beautiful trail winds through the city’s parkland. It also curves through the US Army Corps of Engineers wildlife management area. This organization maintains all native preservation. The pebbled and dirt trails are a perfect blend of the shoreline and the local wildlife. It is really a wonderful place to invigorate your senses as well as your dog’s. The decomposed granite structure of the trail blends it nicely with its environment. Let’s face it, we all love that crunch under our feet as we set out to explore. If you don’t know what I’m talking about, get out on the trail! Listen to the sounds of your surroundings! And watch as your dog embraces the nature around, and try to do the same. This is an amazing opportunity to mingle with local bikers, hikers, and dog walkers. And let’s not forget the well-needed break from the fast-paced city life. Nature has the ability to calm a busy brain, and there is no better place to find peace than The Colony Shoreline Trail.